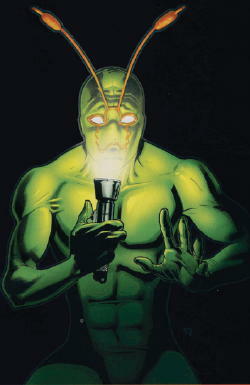 A character from The DCU, created by comic book writer/artist Keith Giffen, Ambush Bug is the Cloudcuckoolander secret identity of Irwin Schwab, a man raised solely on TV who one day discovered a green teleportation suit that was sent within a capsule from a doomed planet (or so he claims.) He has starred in several critically acclaimed mini-series, though he is pretty much on the fringe of the comic universe he inhabits. Ambush Bug first appeared in DC Comics Presents #52 (December, 1982). Originally he appeared as a minor foe of Superman, before deciding to become a superhero himself, though Ambush Bug proves himself utterly incompetent at the job. As time went on, his appearances became increasingly in-jokey, Fourth Wall breaking, satirical and surreal. As a generally Fun Personified character, he wasn't seen much during the pits of The Dark Age of Comic Books, and though he is rarely used by other writers, he still exists in the DC Universe. He became a supporting character in Keith Giffen's Doom Patrol. In the New 52, he's a roving reporter for Channel 52 News, a method of combining information about what's happening in the DCU with a comedy backup strip. His final appearance, unless Keith Giffen is asked to write for him again, is in the Convergence tie-in based on Supergirl: Matrix. The closest Marvel Comics equivalent would likely be Deadpoolnote Mixed with Lobo, with a dash of Squirrel Girl thrown in, though Ambush appeared before either of them. Arc Number: 52 seems to have special meaning for Bug. Arch-Enemy: Argh! Yle! the living sock. Yes, his archenemy is a sock. Attack of the 50-Foot Whatever: One of his nemeses is The Koala Who Walks Like A Man, a parody of Marvel Comics' Giant Monster comics from the Silver Age. It goes "niknak". It's very cute. Berserk Button: He doesn't take too kindly to anyone who threatens TV sets. Ambush Bug (in Superman's body): Destroy TV sets?!! You ANIMAL!! Beware the Silly Ones: So you think the weak idiot in the bright green suit can't do squat, do ya? Lemme tell you this - combine Motor Mouth with Teleport Spam, Confusion Fu and the occasional dash of genre savviness and you got a damn powerful enemy on your hands, buster. Bizarro Universe: There is (or was) a counterpart on Htrae - Bizarro Ambush Bug. Fittingly, he is the only sane person on the planet. Breaking the Fourth Wall: Apparently one of Ambush Bug's super powers. He can also actually see the speech bubbles that come out of characters' mouths, and once asked Zatanna why the text in hers is backward. Or maybe he's just crazy. It's suggested in a one-shot that while he can read speech bubbles (and presumably thought bubbles), he can't hear what other characters on the page are saying — the speech bubbles are his only means of communication. When Mayfair Games published a scenario for their DC tabletop RPG that featured Ambush Bug (Don't Ask! ), he was likewise perfectly aware that he was in a roleplaying game. Even more so, he supposedly comes OUT of the game to interact directly with the players instead of their characters - the back cover was a mask to cut out and assemble to put on for that particular scene. In DC Universe Online, Ambush Bug can be found in the Watchtower (for heroes) or the Hall of Doom (for villains). His first line is "Hey, look who's in your video game!" Ambush Bug stars in the Grand Finale of Batman: The Brave and the Bold, where he helps Batman try to save the show from Bat-Mite's attempts to make it Jump the Shark and get cancelled. For extra credit, Bug is voiced by Henry Winkler, the original shark-jumper. Clingy Costume: The zipper is stuck. Companion Cube: Cheeks the Toy Wonder, a Big Boy doll Ambush Bug adopted as his sidekick. Note that Cheeks isn't alive or even animated (except when he briefly became undead), Ambush Bug just thinks so. He also wears a costume reminiscent of El Chapulín Colorado's. Curse Cut Short: Meta, thus combined with Gag Censor. In an splash page, the sentences are riddled with Ambush Bug's teleport sound. Comes handy when the editor describes him as a pain in the *pop!*. Determinator: Goes against Bat-Mite and endures a round of being beat down by Batman and Aquaman in an effort to save the Batman: The Brave and the Bold universe from being deleted. End-of-Series Awareness: Ambush Bug throws an after-party at the end of his first miniseries. He also convinces Batman to ensure his Silver Age exploits end up with as much dignity as possible, even if they failed to save the show. He convinced the villain in the Doom Patrol series to drop his plan, 'cause the book was being cancelled and there was no hope for him to see how it ended. Fourth-Wall Mail Slot: Ambush Bug answered his own letters, and in his first issue was puzzled that he had to wait months for feedback from the reader who had just finished the book. Fun Personified: He first appeared as a fairly standard supervillain, but within just a couple appearances had jumped into outright comedy, making fun of the fan obsessions of the day. So much Darkseid is willing to go karaoking with 'im. Gag Series: Every issue skips from place to place in The DCU making fun of everything from Superman to The Sandman. When he appeared in an issue of Supergirl's comic, he mistook her for a Gender Bent Superman. During his latest miniseries, he also found his own gender-bent alternate. Grand Finale: In an interview, Keith Giffen stated that Ambush Bug's appearance in the Supergirl Matrix tie-in for Convergence is the final Ambush Bug story, unless he's asked to do something else with the character. HeelFace Turn: He started off as a supervillain and decided to become a superhero. Ignored Expert: Parodied with Brum-El (a parody of Superman father, Jor-El). Brum-El was not a scientist, just The Dandy in a very advanced civilization, and instead of saving his family, he chose to save his wardrobe. Again, when his planet failed to be destroyed, he was just mocked and left naked. Interactive Narrator: In one of Keith Giffen and Robert Loren Fleming's stories, the story's villain plans, after attacking the heroes, to go after the narrator for an egregious pun. Intrepid Reporter: In the New 52. Lampshaded the Obscure Reference: His appearance in TBATB is lampshaded by fellow fourth-wall-smasher Bat-Mite. "You're a pretty obscure hero even for this show." Living Clothes: The archnemesis of Ambush Bug is Argh!Yle!, a sentient sock with a Doctor Doom mask. He hates the Bug because when Argh fell to earth, Irwin Schwab (the man who would become the Bug) left him to die while rescuing what became the Bug's costume suit. Medium Awareness: He has an uncanny ability to see through Clark Kent's disguise, and even remarks how no one should be fooled by it. Superman was not pleased. Supergirl took it with more grace when 'Bush revealed he knew who she was, merely by observing her in both her identities. Meta Guy: One of the first of the modern versions. Postmodernism: The meta-knowledge is the driving gag behind Ambush Bug. Who happens to be insane, so all that stuff could just be in his head. Punny Name: Argh!Yle! (obviously), Brum-El (less obviously - ever heard of Beau Brummel?) and possibly Irvin Schwab. note In German, a "Schwabe" can mean a cockroach. And poor Homer Spalding is named only for making the mischief Ambush Bug does to him punnable. Rage Against the Author: Giffen/Bug isn't above lampshading DC Comics' faults (or his own). Or those of Marvel Comics. Dan DiDio is one of his mortal archenemies. When fighting against Bug, he's an idiot intent on destroying the damn green pest. Before that, there was editor Julius Schwartz. Shout-Out: Expect to see several in pretty much every comic about him. (As well as the occasional Take That!.) Appeared in Tiny Titans dressed as the mysterious Pandora that showed up in DC the first issues of the New 52. Sliding Scale of Silliness vs. Seriousness: He's probably glued himself to the farthest end of the silly side of the scale. Stuffed into the Fridge: Parodied with a sequence where Ambush goes shopping and cannot find a fridge without the body of an ex-girlfriend in it. He settles for a mini-fridge with a pygmy corpse inside. In fact, through the entire issue, there are dozens of female corpses all over the place. Some even get lobbed at Bug. Super Hero Origin: Parodies Superman's. The greatest dandy in an alien world, Brum-El, decides to discard a chain letter, and as a result, discovers his planet is going to be hit by a swarm of meteorites which will kill all life. Against the belief of all experts, he creates a rocket... to save his wardrobe. And then it turns out the meteorites really were harmless, leaving the man naked and humiliated. And then a giant radioactive space spider loots the rocket before accidentally nudging it to Earth, where it crashes, leaving one of the rocket's two remaining contents - a lime green suit - stuck in the antenna of a random Metropolis loser. The other item? A sentient sock. Who immediately becomes a Doctor Doom parody, angry at being left behind. Superman once heard the story. He thought the idea of a scientist building a rocketship to save something from a doomed planet the dumbest story he'd heard. Super Zeroes: He's definitely one. Teleportation: Ambush Bug's original actual superpower. Early appearances required there to be one of his cybernetic bugs at the destination, but this limitation was eventually removed via lightning. Teleport Spam: Part of the reason of why he's a great fighter when dueling against serious enemies. Superman has learned to loathe this. Thought Caption: Ambush can see 'em. Took a Level in Badass: Originally, he needed small electronic "bugs" to teleport. He has since internalized the ability. Wacky Sound Effect: Meta. The letterer had to work overnight and didn't want to wake her baby, so the bomb does not go kaboom, but a soft tinnnng. What Did I Do Last Night? : In Ambush Bug: Year None, he wakes up and finds he got married to Dumb Bunny of the Inferior Five. And then he tries to have his marriage annuled by Neron.